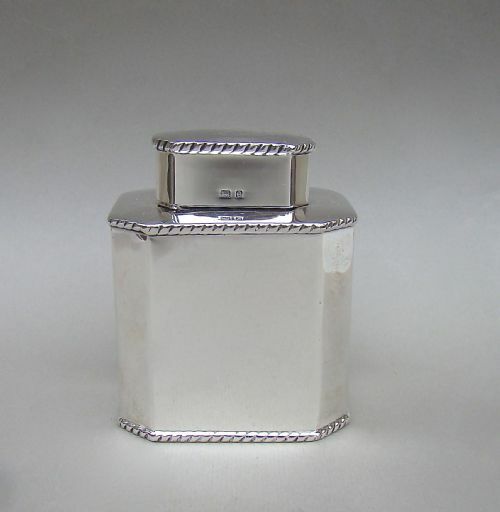 This very elegant Arts & Craft movement solid silver tea caddy is a rare piece. It has a simple and beautiful oval outline and a pleasing hinged domed lid. The lid with stylised embossed diamond-shaped finial. It bears the hallmarks of the department store Debenhams who traces its history back to 1778 and became Debenhams Limited in 1915. It has an excellent silver gauge and feels satisfyingly heavy when picked up. The images do not do it justice. Both top and base with fine ovolo border. The underside inscribed "Debenhams Ltd"
Good gauge and wonderful quality. D LD for Debenhams Ltd.
Width: 9.5cm / 3.6 inches. 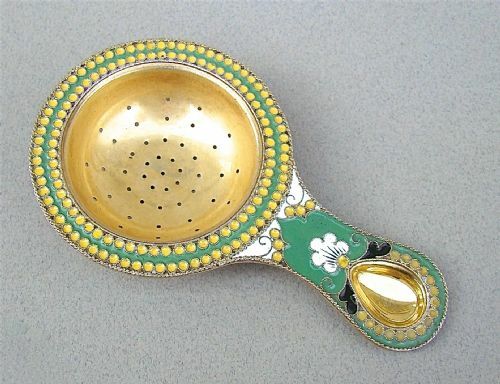 This is a very decorative Soviet Russian polyvhrome enamel sterling gilt silver 916 tea strainer. Of circular form with yellow and green beaded border. The handle embellished with cloisonné enamel floral and foliate design in tones of green, white and yellow accented with further black enamel motifs encompassing the concave thumb piece. Fine rope twist borders surrounding the strainer. Soviet silver mark: Hammer and sickle star emblem. The Russian hallmarks struck to the reverse of the strainer bowl are all very clear. Length 11.5cm / 4.4 inches. Bowl diameter: 6.5cm / 2.6 inches. Height 2cm / 0.7 inches. 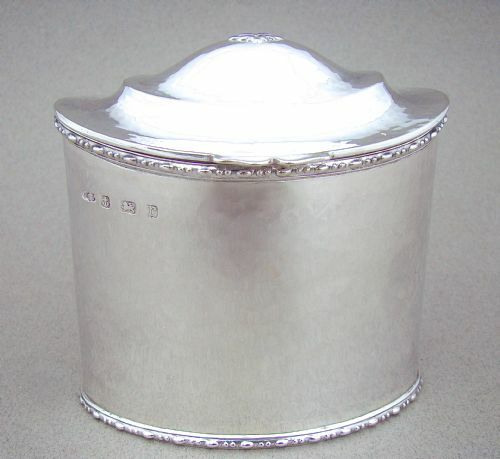 This is a very elegant solid silver tea caddy made by the prolific silversmith William Aitken and dated Birmingham 1905. Of canted rectangular form with gadroon borders, the pull-off lid with conforming decorations. It has a good silver gauge. Width: 7.5cm / 3 inches. 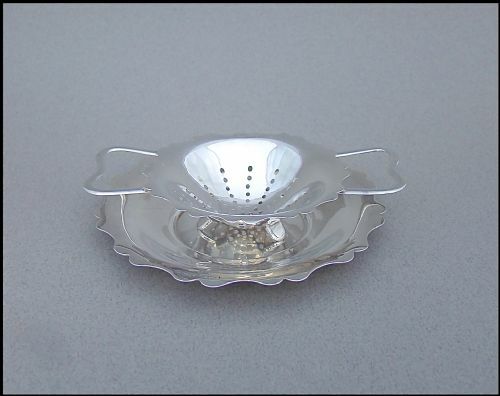 This stylish silver tea strainer and matching stand was made by E J Houlston and is dated Birmingham 1920. The scalloped circular bowl with wire-work handles. Rests on the original stand. The shallow stand with a conforming scalloped edge. Stand diameter: 10cm / 4 inches. Length handle to handle: 11cm / 4.4 inches. 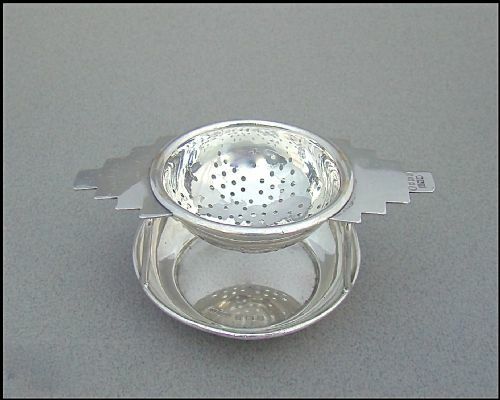 This is a very distinctive Art Deco silver tea strainer made by William Redfern Deykin & Walter Andrew Harrison. The pierced circular bowl flanked by a pair of geometric handles and fitted on an associated stand. Both tea strainer and stand dated Birmingham 1935. The stand made by G F Westwood & Sons has a plain saucer fitted with wire-work supports. D&H for Deykin & Harrison. Length handle to handle: 10cm / 4 inches. 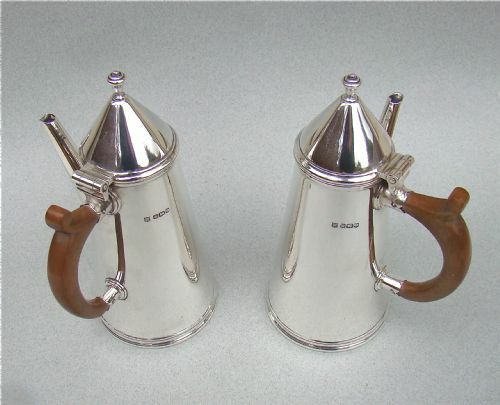 This is a fabulous and extremely elegant pair of sterling silver coffee pots inspired by an early 17th Century design during the reign of William & Mary. 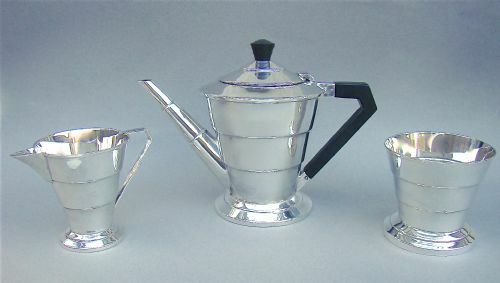 Each coffee pot having a plain circular body with tapering sides, a conical hinged lid with finial, a straight spout and a light wood side-handle. Each with an excellent silver gauge. The base engraved with retailer's marks "Irvine Hindle Halifax" and with the words "reproduction 1689"
TB&S for Thomas Bradbury & Sons. Date letter "p" for 1933. Diameter of base: 8.5cm / 3.2 inches. Weight: 765g / 27 oz. Wooden handles in very good order. 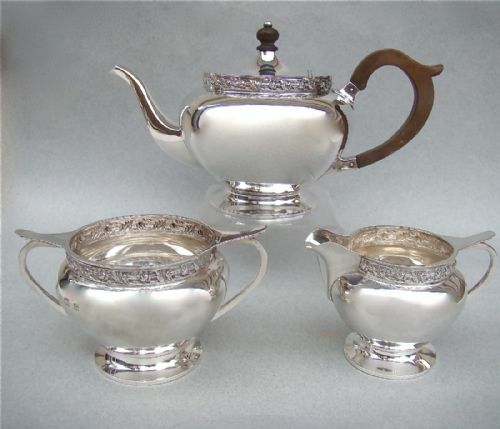 This is a very distinctive solid silver Art & Craft three piece tea set made by the highly collectable A. E. Jones. The teapot of bullet form with a flat hinged cover. All three pieces applied with a decorative floral band. The horizontal lug handles on the sugar and cream jug and the applied floral band are very much a feature of A. E. Jones designs. All three pieces raised on a spread pedestal foot. Pale wood handle and finial on teapot. A.E.J for Albert Ernest Jones. Height: 13cm / 4.2 inches. Length handle to spout: 11cm / 4 inches. 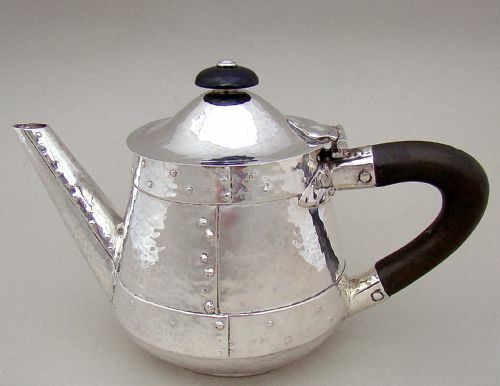 This very distinctive and fabulous Arts & Craft, spot hammered, silver bachelor teapot and is dated Birmingham 1907. The tapered body with unusual and wonderfully executed rivets decorations, resembling a riveted leather vessel. Ebonised wooden handle and finial. Height: 12cm / 4 inches. Base diameter: 10cm / 4 inches. No dings or dents . 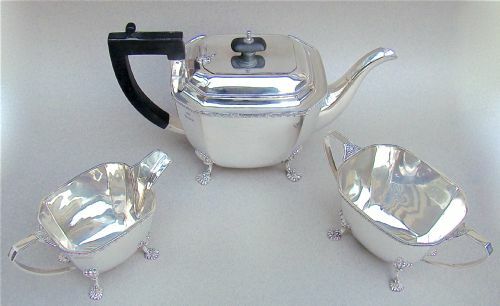 This very elegant solid silver Art Deco tea service was made by the prolific silversmiths Viner's Ltd and is dated London 1934. Each piece with a conical stepped body and raised on a conforming pedestal base. Ebonised wood handle and finial. The wood finial carved to match the design of the service. The simplicity of the lines is very reminiscent of the Art Deco era and gives this service a timeless elegance. Date letter "l" for 1934. Height up to finial: 17cm / 7 inches. Length handle to spout: 12cm / 4.2 inches. Diameter: 9cm / 3.4 inches. 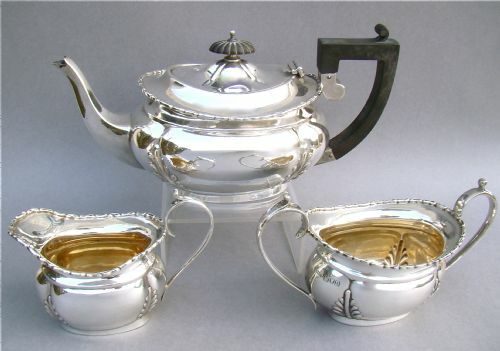 This is a very elegant solid silver Art Deco tea service made by the prolific silversmiths Deakin & Francis Ltd. Each piece with a very good gauge of silver. The teapot with a tapered plain body and flat stepped hinged cover. Both cream jug and sugar bowl with a conforming form. Pale wood handle and finial. The understated design and the simplicity of the lines gives this service a timeless elegance. D&F for Deakin & Francis Ltd. Date letter "O" for 1937. 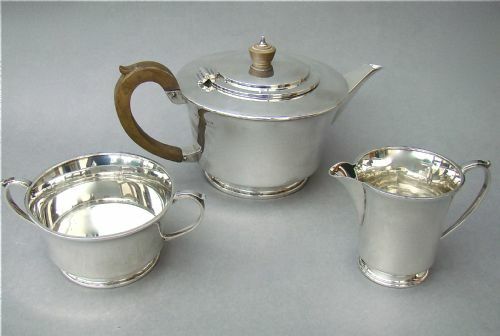 This very elegant solid silver three piece tea service is dated London 1915, making it exactly 100 years old. The teapot of traditional oblong bellied form has an ebonised handle and finial and is embossed on each corner with pretty sprigs. The sugar bowl and cream jug, embossed with conforming decorations and heightened with an elegant scroll border. S&Co for Skinner & Co. Date letter "u" for 1915. Height: 7cm / 3 inches. Length handle to spout: 12cm / 5 inches. Length:: 16cm / 6 inches. Combined weight: 633 g / 22.4 oz. Excellent; no dings, no dents, not engraved. Good set of marks on three pieces.